This little guy was part of a set of alphabet animals my mother in law had - I am not sure if she had the entire alphabet, or only some of them, but in any case she gave up the "T is for Turtle" one to add to my collection. 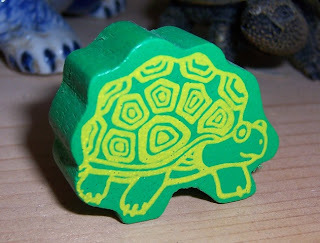 This is just a little turtle - probably about 2 inches across, and made from painted wood. It has the letter "T" on the back. 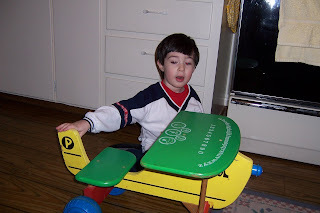 I love that my mother-in-law has most of her children's toys - from puzzles to my husband's wooden airplane - to games and more. Even better is that the Munchkin is getting to enjoy many of these toys. In fact a whole bunch of classic wooden tray puzzles just made their way from her basement to our play room. The Munchkin is in puzzle heaven! A few years ago I used the phrase "fun without batteries" to describe the type of toys my mom carries in her store, The Mercantile. Puzzles, tops, kites, puppets - the type of toys that you play with rather than the toy "playing" for you. Lucky for us BOTH Grammas are great supporters of this type of play, so batteries driven toys are a rarity in our house. It is so great to her my little one "talking" for his toys and role playing different stories, rather than just pushing the button and watching or listening to someone else's idea of fun. What was YOUR favorite toy growing up? Mine was probably my "Sunshine Family" dolls, and the A Frame wooden playhouse my brother made for them. I would spend hours and hours making up stories about their lives, or practicing my early sewing and knitting skills making clothes and bedding for them (that is about how long my knitting career lasted - a 4x4 doll blanket was about the extent of my patience with that). My best friends Lydia and Ursula also had these dolls - and the grandparents that went with them - so the three of us had great fun with our "neighborhood" of families. Of course the blocks and the kites and the bicycles and the ice skates were all great fun as well. Growing up in a rural area also gave us lots of options for outside activities. 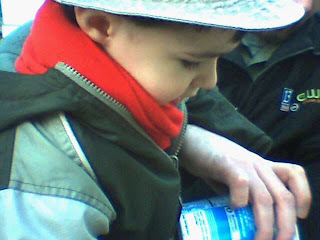 Anyone know where I can find some tadpoles to show my son what that is all about? Or a chrysalis? Or lightening bugs that are not dimmed by having too many streetlights about? Hubby and I are looking forward to our first family camping trip - hopefully this summer if all goes well. T is for turtle... and F is for good old fashioned FUN! In addition to work and home and crafting, I am also a very active Lions Club member, as is my husband. He was a Lion in Pendleton, SC before our move to NY, and I joined shortly after we moved here, primarily to meet people in our new community and do something good with my time. Little did I realize that many members of my Lions Club were active within the organization at the regional, state and international levels, and soon drew my husband and I into volunteering in larger capacities, capitalizing on our skills and interests in writing and web design, as well as leadership training and communications, to enhance the organization and our service to our communities. This weekend is our annual convention for all the Lions Clubs of New York State and Bermuda. We will be converging on Niagara Falls, NY for 3 days of fun and fellowship, sharing ideas as well as touching base with old friends and probably making some new ones. I am leading a workshop to promote our Lions Leadership Institute, a 4 day intensive leadership training seminar that I help coordinate each year, as well as having a booth with hand printed greeting cards to sell as a fund raiser for the institute (hence my hours with the Print Gocco recently). 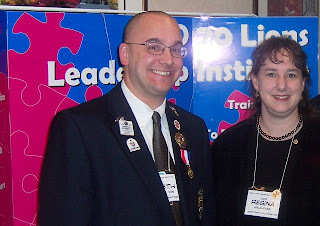 This photo is of me at our booth with my good friend Ken, previous coordinator for the institute, and incoming Council Chair for the Lions Clubs of New York State and Bermuda. Hubby is helping with a seminar on building a website for your Lions Club, as well as helping me out. And the Munchkin is spending a fun filled weekend with Gramma, Grandpa, and their new dog, Lilly. If you have an urge to serve your community, check out your local Lions Club. It's a great organization with lots of opportunities to do good, and usually fun, things. Even if you don't want to join, you can support the club's activities and fund raisers, and don't forget to give them your used eyeglasses or hearing aids. I am working on my first ever watercolor quilt - fusing 1" squares of fabric to a fusible gridded interfacing, then stitching along the grid to form a mosaic design. It is still a work in progress, but I thought I would share how I spent 4 hours yesterday, mostly on my knees. I started with an image I found online, and through various manipulations I turned it into a mosaic pattern (tutorial to follow on this someday - I hope). The general gist of it is a seahorse in a bed of seaweed underwater. This will be the center panel of a baby quilt for a mommy who loves seahorses. 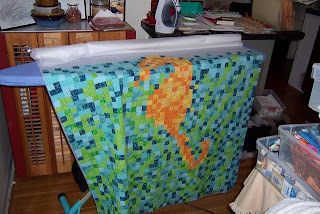 I used the printout first as a fabric buying and cutting guide, and then primarily as a guide to assembling the seahorse - once I had that in place I got a little more freewheeling with the seaweed and water squares. I started out by unrolling the interfacing on the kitchen floor (and yes, I have way more than enough, but there is another project planned for the remnant). The bottle of sunscreen is anchoring the interfacing where it ran in front of the heat vent since it was blowing things all around. 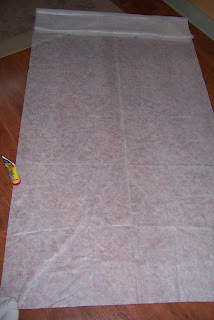 I did have some trouble seeing the grids because they were light brown on a brown floor, so I added a piece of paper under the area I wanted to work on to help. I slid my pressing mat under the interfacing, adding a few placemats under that to catch the heat and steam, and started fusing things in place right on the kitchen floor (the floor was clean - my in laws had visited the day before!) Once I was able to get up and around the seahorse itself to get it fused down, I decided to move the entire operation to the ironing board. Unfortunately, even with the estimates provided by the pattern I came up short on my fabrics and right now the top of the seahorse is barely under water. I need a trip to the fabric store to get just a few more inches of the blues, and to determine my borders, backing and bindings. The baby shower is May 10th - don't think I am going to make it - but I may surprise myself. 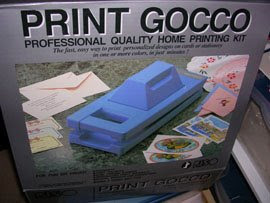 When I was an exchange student in 1985-86, my one host family had a Print Gocco, this wonderful contraption that allowed you to make your own silk screen image, ink it up, and print. After being exposed to it again when I was teaching there, and getting to play with it more myself, I was determined to get one. Why I never bought one in Japan I don't recall - and once I got back to the states one thing or another always postponed my search for one. Finally in 2002 hubby and I splurged, and the Print Gocco finally was mine! A few custom printing jobs for some friends paid for the initial purchase as well my big box of inks and supplies, and so I can now use it with no guilt or overhead. Also luckily I discovered that a good cleaning of a screen (and storage in the fridge -although I am not sure that is completely needed) will preserve screens enough for them to be reused. Screens of designs I created in 2003 were used just 2 nights ago to print 200 greeting cards for a fundraiser I am doing. I primarily print 2 color images - using ink separators to section off the ink pools and allow me to print with one screen rather than doing separate screens for separate colors. I have done that once - and it was frustrating. My "craft" is printing greeting cards - although I am looking to get or make the handle that will allow me to stamp on fabric so I can play with designing my own quilt labels without some of the fuss of the printer fabrics. I have seen some incredible multi color overlay prints that people have done (this is just one artist you can find if you google it) - prints that really stretch the capabilities of the printer, and the imagination. That's not so much my thing but I like my Gocco for what I do with it. Maybe it is time for me to do a turtle card? New turtles have been finding me of late - maybe it is all my turtle posts, but ever so slowly lots of fun- and very different - turtles have been making their way to my door. 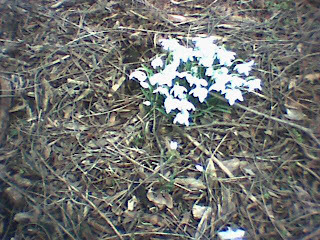 The latest was this one from Barb at So How Was Your Day. Barb makes these great little pouches, and in early April I was fortunate enough to be selected for one in a giveaway she had. The package arrived yesterday, and imagine my surprise to find the fabric was turtles! 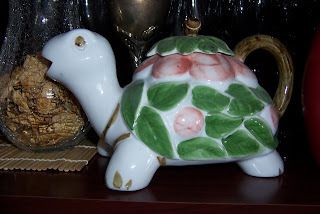 Now I don't know if Barb has been on my blog and knows of my Turtle collection - I suspect she does. This was actually a bag she had pictured on her blog in March but I had not looked closely enough at the picture at the time to realize it was turtles. So either I got the luck of the draw, or Barb has been paying attention. Either way - thanks!!! It will be well enjoyed!! 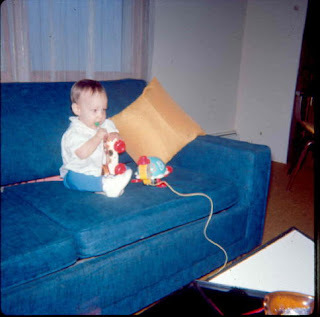 I had forgotten about this picture until my SisterCindy reminded me - check out the little turtle pull toy on the sofa next to me. This was my first birthday. I guess I started really young with the turtle thing? And let me say it again - I LOVE LOVE LOVE LOVE these earrings! 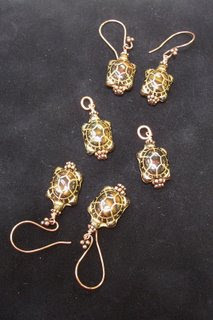 They have a heavy copper wire top, which is surprisingly comfortable in the ear, and they go with EVERYTHING!!! I have had them in every day since the package arrived. When I was living in Japan as an exchange student, I was able to convince my host family to let me study Japanese calligraphy. I soon learned that learning to write characters with a brush was as much an exercise in learning to "paint" as it was to think, and breathe, and be. Kneeling at a low table with my back straight, and the brush forming an extension of my arm, and my heart, I slowly and carefully learned the rudimentary basics of this art. My goal was to gift each family with a frameable piece they could keep. My teacher helped me along, and at my farewell party I was able to make such a presentation. Imagine my amazement when I returned to visit 4 years later and found that one family had theirs still hanging in the living room. To my more educated eyes at that point, it looked very rough and erratic, but they said it truly showed my effort and my heart, and that is why they kept it all these years. Although I chose not to pursue the study further when I returned to Japan to teach, I always found a fascination in the paper, brushes, inks, and other accouterments of brush calligraphy, and bought some for myself, although they sit unused. According to my teacher, the tools which are essential to a brush painter are called "THE FOUR TREASURES". These are the Ink SUMI, Grinding Stone SUZURI, Brush FUDE and Paper KAMI. Other tools that are beautiful to look at include the paperweight to hold down the paper, and the water bottle to hold water to mix with the ink stone. This turtle is a water turtle - with a small hole to fill in it's shell, and a small spout in it's mouth. 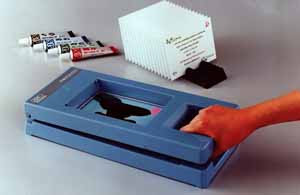 Little bits of water are poured onto the ink stone, and then the ink stick is dipped and ground. He is made of iron and very heavy, and lends a quiet air of contemplation to any session of calligraphy. 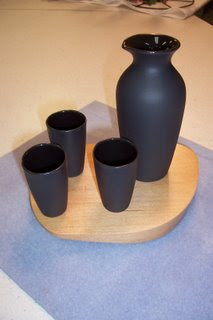 The picture here is one of my SisterCindy's sets of Ebonyware porcelain. She's gearing up for a big craft show called Celebrate Clayton in Clayton, GA on April 26 & 27, so if you are in the area be sure to stop by and look for the Higgins Design Studio Booth and tell Cindy that her baby sister sent you. Pick up and feel her pieces - they have a such nice "hand" to them and are lovely to use. Both are just getting off the ground, as the girls figure out the mechanics of posting pictures, the challenges of dial-up, and which direction these blogs will go. I cannot promise what the content will be - but knowing the creativity of my sisters and the entire family I am sure it will get real interesting, real soon! 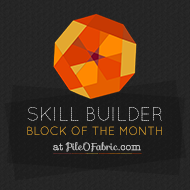 I signed up for a PIF on Gina's blog so now it is my turn. The first three people to comment on this post will receive some QueenBee handmade goodness - and then it will be your turn to PIF! The graphic here is from an event in Singapore - part of their Singapore Kindness Week. I loved the graphic, and the event sounds interesting, too! What a great way to get to know your neighbors. Sometimes I think it's a bit sad that I don't really know my neighborhood and extended neighbors better - and we have been there 7 years. I remember growing up in a tight knit neighborhood and wonder if my son will have some of those same experiences, or not. When I started this story, I mentioned the tiny shell turtle I purchased on a school trip while in Japan. I had it wrong though - I must have given my friend the white one, because in my teddy bank I found the purple one. The bank is a story itself - I was given it for my 19th birthday, which I celebrated in Japan. Actually I was given the key to a public locker. You know the kind you put a quarter in (or 10 yen I think?) and get the key? Well - the bear bank was sitting on top of his box inside the locker, with his little sign in his hand. It now holds a bunch of little memories from that year in Japan -five yen coins, a Hershey's Kiss paper that was WAAAYYY longer than usual, a special coin and grain of rice from a temple at New Year's, and this teeny tiny little purple turtle. I had not originally planned for a turtle block in my Summer Sunshine Sister's Choice quilt, and I was working on doing 20 blocks to Lazy Sister Sue's 25. 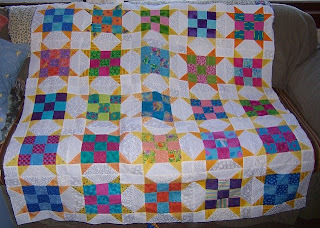 However, a day spent spring cleaning my studio/attic unearthed a bag of scraps left over from one of our first collaborative quilts, another Quiltville.com pattern we made for our nephew, who is now 8! There was enough to nearly put together 5 more blocks, and a dip back into my stash produced a FQ of a turtle batik that LSS had given me (I think). Of course this had to take "center square" in Summer Sunshine. There's a bit of a lot of old projects in this quilt- a nephew's quilt, my son's quilt from Aunt Sue, part of one of my son's pillowcases that LSS helped me find the fabric for, a crabby Lazy Girl Summer Tote we made for Mom, my first Summer Tote, Turtle Crossing and Trouble with Turtles just to name a few. It will be nice to curl up under all these old - and new - memories! What could be warmer!? The quilts are closer to done, and so Lazy Sister Sue and I decided to finally share our tops with eachother. It was a down to the wire project - both of us worked on our tops this weekend, LSS at a quilt retreat with friends, and me at my dining room table while the Munchkin played or napped, and hubby worked on some freelance web gigs. LSS has not named her quilt yet -but I am calling it Black Starred Susan because all her star points are black. Mine I am calling Summer Sunshine, and you can see all the points on mine are yellow/orange. 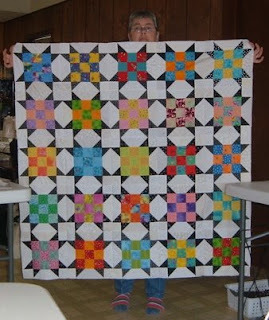 Great thanks to Bonnie at Quiltville.com for this great pattern and the idea of unifying the scrappiness of it with a consistent star point color. Believe it or not none of our 9 patches match! With more than 50 colored fabrics alone - we both had a lot of possibilities. I won't even try to do the math. Now to work on the borders and come back again with finished quilts. That will take a while longer - but for now this is where we are. And now to plan our next joint project... hmmm... any recommendations? Yesterday I came home to find this in my mailbox. An online quilting friend had been hinting to our group that she had sent a mysterious package to someone. As I cannot think of any other reason why I would have received this - since I did not order it - I can only imagine that it is from her. I am in danger of falling behind. I started so quick out of the gate with my Sister's Choice swap with Lazy Sister Sue, and then put the brakes on a bit while waiting for some more strips. I got myself distracted with other projects and now things are coming down to the wire. Lazy Sister Sue is headed out tomorrow to a quilt retreat weekend with some of her friends, and plans to work on her Sister's Choice all weekend. I've got some work to do to meet our Monday/Tuesday unveiling goal - but at least I have a bit of a head start??? I actually uncovered some strips in my attic during my deep spring cleaning session earlier this week - leftover from a collaborative quilt the two of us did for our nephew. They are the PERFECT colors for this swap - and I think I have enough to get me up to the 25 blocks LSS is putting in her quilt (I only had 20 out of the strips we had so far). ...it's going to be neck in neck right to the end! 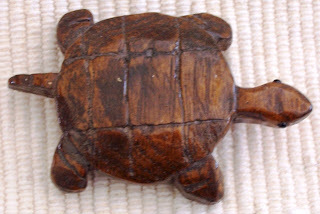 Turtle of the Day - "hot stuff"
Just a simple turtle trivet. No recollection where I got it, other than it was in the US after I returned from Japan - and it is not the best trivet because his head sticks up a bit and causes larger pots or dishes to be off balance. 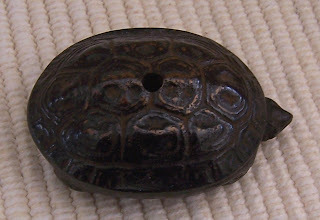 He hung on the wall in my various rental kitchens, but has yet to find a permanent nook in this house, so right now he is hanging out in the attic, where I am still looking for one really cool turtle I KNOW I bought in Japan and cannot recollect having ever unpacked since my return in 1993. I grew up in the very small town of Alfred, NY - and probably the biggest community event in our town, not counting Hot Dog Day, was Saint Patrick's Day. Held from 1933 until 1986 (which I just learned... - I graduated from high school in 1985, so it ended right after I left) according to an Alfred history website, probably nothing has created more long-term interest and engendered more enthusiasm among students than did the annual St. Pat's Celebration. 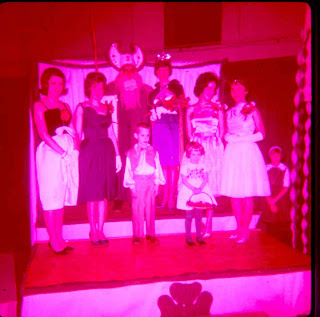 It went through many phases over the years - and my siblings participated in a variety of ways as children with the St. Pat's Ball, as students when the town used to get painted "green" with green tinted pottery slip on public windows (St. Pat was here, etc..), to the annual parade which we marched in as Camp Fire Girls, Boy Scouts, or school band members. This picture shows St. Pat and his "court" - with my Brother Bill and Lazy in Training Terri the two little cuties down in front. I am not sure of the whole story behind how they got chosen for this "honor" - maybe they will fill us in?? It was fading out as I grew older, but I remember that each year the ceramic school would make and sell some kind of commemorative piece - a shamrock shaped ashtray, a kidney shaped dish, or, as in 1980, a turtle shaped coin bank. I guess this was more accurately the start of my turtle collection. I found it yesterday as I was doing some deep Spring Cleaning - unfortunately it is as it normally was - empty. I think the Munchkin can start filling it, though. And I will tell him all about how crazy people used to let us out of school on a usually snowy day in March to watch a parade! Turtle of the Day - "...and two makes a collection"
This is the wooden turtle from Mom that matches the tiny shell turtle and started the collection going. It's about 4 inches nose to tail, and very flat. While doing some spring cleaning the other day, I realized how many tote bags I have - both those I have accumulated over the years, and those I have made recently from Lazy Girl patterns. I've always liked tote bags I guess - but never really thought about it much. I have never been a purse carrier - for a while I did the "wallet on a string" type of purse, and I floored both my family and my co-workers about 5 years ago when I went through a little spurt of purse buying, but then I found I was just tucking the purse into the top of a tote, so now I just save those purses for occasions when the tote just is too much (although I am working on making some purses for those instances). 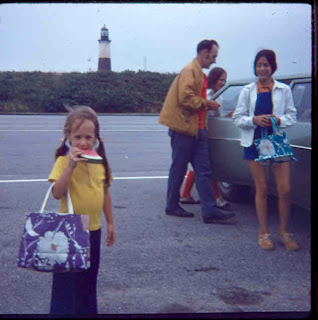 I was browsing through some old family slides this morning - I had actually intended to post about something entirely different and was looking for an incriminating photo of Lazy Sister Sue to illustrate the point - but instead came across these photos of me - with a tote bag!!! The first is the summer of 1972 - somewhere on Long Island I think. That's me with the watermelon and the big purple tote. Dad and Lazy In Training Terri are in the back, and Sister Cindy is keeping an eye on me it looks like. The second is my first day of school - kindergarten - waiting at the bus stop with most of my older siblings. Lazy Sister Sue had gradated from High School the previous spring, and was starting college. Sister Cindy and I must have gotten matching totes that summer - because we both have them in both pictures. Interesting that mine is the purple one - since purple is definitely Cindy's favorite color now. Mine also looks bigger- or may be it was because I was smaller. 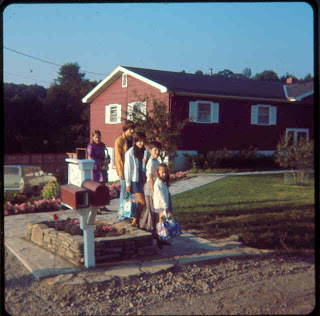 It's funny looking back through the slides - I remember some of the clothes and especially the Halloween costumes - I remember the jacket that my Big Brother Bill is wearing in this photo (he is the 4th in line) - but I don't remember this tote. I wonder if the Munchkin will remember his totes? He's very possessive of them, and notices quickly when "Mommy has a new bag!" Turtle of the Day - "the other cousin"
The Munchkin lent me his camera last night while we were out in the yard filling bird feeders. 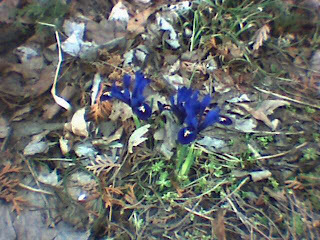 The snow cover is gone - and the crocuses and snow drops are blooming. The "cousin" turtle is a bit "bird blessed" and could use a good bath, but is waiting for his warm cloak of sedum to grow up around him. I got a 'squishie' in the mail from Lazy Sister Sue yesterday - I must have hubby and the Munchkin converted, because as soon as hubby returned to the car from checking the PO Box, he tossed me the package, and both he and the Munchkin called out "squishie!!!" It was full of white fabric strips to finish out my fabric needs for the Sister's Choice project. I just need to cut them to size, and then I can start assembling my star points and blocks. Lazy Sister Sue goes on her quilt retreat next weekend, so I have until Sunday the 13th to finish up if we are going to "unveil" together. I don't think that will be too much of a problem - at least for the inner blocks. The border may take a bit longer. 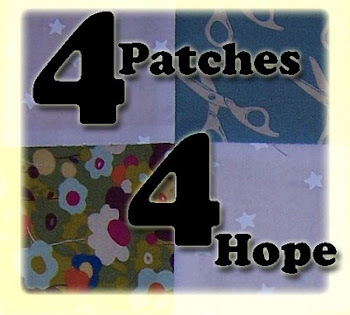 I 'need' to go back to JoAnn's tomorrow after work - I picked up what I thought was gridded fusible interfacing to work on a special project (tutorial to follow later) but it was NOT fusible, so I need to go get the right stuff. Me at a fabric store the day after pay day - could be dangerous. Turtle of the Day - "cousins"
This turtle is at my brother's house - but is a "cousin" to one I have in my garden. 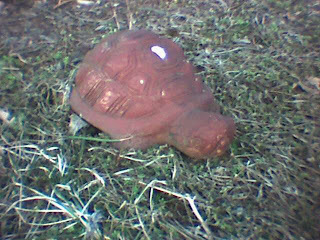 I don't have a photo of my garden turtle because - up until a few days ago - it was covered with snow. We visit my brother and his family in MA every year for Easter. We started in 2000 when we moved to NY from SC. The 2nd year we visited, my sister-in-law and I started going on a little shopping trip sometime during the long weekend - usually hitting Marshalls and Filene's Basement. The turtles were purchased during one of those trips - one for their living room, and one for my garden. We've come home with all sorts of other fun things from that trip, like my "birdbath" which is a big shallow serving platter shaped like a big yellow chick, a pasta maker for playing with my polymer clay, and a lions head plaque to hang in my entry way. 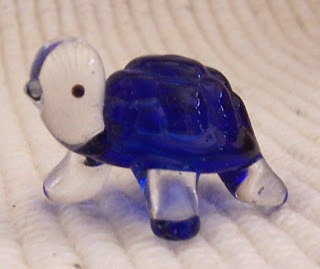 Turtle of the Day - "Glassy"
He's about 2 inches tall and such a lovely clear blue. I like his little 'mouth'. I am making progress on a few projects -slowly - and starting a few new ones. One of the new ones I plan to write a tutorial on, so I am saving the pictures and such on that one for later. 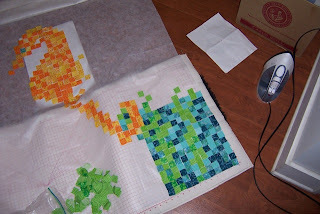 This first picture is my Disappearing Nine Patch in progress- this is using charm packs from Moda's A Morris Garden. I am using 5 packs (30 5" blocks each) and making 16 blocks (12 done so far) - then cutting the blocks and reassembling into a Disappearing Nine Patch - randomly. This is before they get cut down, and does not reflect the final block placement at all. I just wanted to get an overall shot of the colors to show. 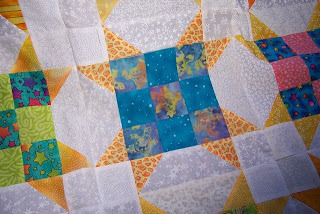 I plan to pull in one of the lighter blue on blue blocks in the border fabric, and a dark blue binding I think. This other project is just a little "twiddle" that I found online and wanted to play with. I have not done paper foundation piecing in a few years and was thinking of teaching a class on it at our local continuing education program at the high school, so wanted to brush up on my skills. My mother gave me this teapot for Christmas or my birthday one year - it has never been used for tea, but makes a great member of the Turtle collection. Right now it has taken up residence in my little china cabinet, and keeps an eye on the Munchkin as he sits at the dining room table. He knows Mommy likes turtles. After our trip to the museum in Boston and his adventures in the water play area (full of balls and fish), I purchased a tube of toy fish to add to his bath-time fun. 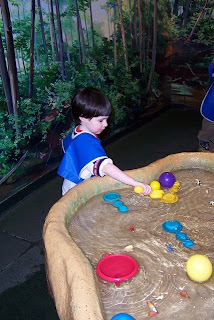 As we went through the names of all the fish, he noted that "Gramma likes crabs", that "Nemo" was there, but Nemo's daddy wasn't (there was only one of each fish), that the eel has to go back to the ocean (thanks to Curious George and the One that Got Away), and that there were no turtles. That's exactly what I was wondering!